Thursday, Nov. 30, 2017, London, UK: The Biogerontology Research Foundation announces the launch of The Longevity Podcast, a podcast produced in partnership with the Oxford University Scientific Society (OUSS) by Jakub Stefaniak, Director of Public Outreach & Education for the BGRF and President of the OUSS. "I am very happy to announce my personal project under the guidance and help of the Biogerontology Research Foundation and the Oxford University Scientific Society. The Longevity Podcast's purpose will be to discuss the latest scientific advancements, as well as provide an introduction to the science of life extension in an easy and accessible way. Over time I plan to invite a number of distinguished scientists for interviews and debunk a number of pervasive myths surrounding gerontology, to hopefully contribute to public engagement in an area that can, let's face it, be a bit murky at times." said Jakub Stefaniak, Director of Public Outreach & Education for the Biogerontology Research Foundation and President of the Oxford University Scientific Society. In its inaugural episode, the podcast delves into a basic introduction to geroscience and ageing research, introducing listeners to basic concepts in biogerontology and a discussion of what the fundamental hallmarks of the field are. The podcast then goes into an introduction of biomarkers of age, the distinction between biological age and calendar age, and why this distinction is important. "Since it's inception almost 10 years ago, the Biogerontology Research Foundation has put great emphasis on public outreach regarding ageing research and the field of biogerontology, including encouraging young scientists to enter the field and hosting conferences to increase public awareness regarding the importance and potential impact of ageing research, because public knowledge and support of its aims and mission are the central drivers of funding within the field. 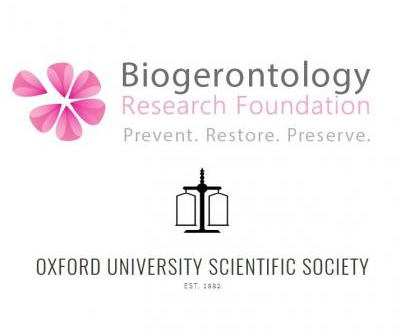 We feel that this podcast, a joint effort of The Biogerontology Research Foundation and Oxford University Scientific Society, will serve to broaden our public outreach activities, and we hope that our activities within Oxford and other UK-based insttutions continues to grow" said Franco Cortese, Deputy Director of the Biogerontology Research Foundation. Future episodes will feature discussion on some of the largest emerging trends within ageing research, profiles of some of the key players in both the geroscience field and the emerging longevity industry, and interviews with some of today's thought-leaders in the longevity sphere. "The launch of this podcast represents an important benchmark in the continuation of our past efforts in increasing public awareness of ageing research, such as the Big Data Science in Medicine conferences that we produced at Oxford several years ago. Forming strategic partnerships with well-respected UK institutions in the London, Oxford and Cambridge triangle is part of a broader effort to heighten the status and recognition of ageing research within the UK academic and policy community and to support the provision of more funds into this important sphere, which has the potential to usher in a paradigm shift in healthcare away from palliative and reactionary disease treatment toward comprehensive personalized healthspan extension and disease prevention" said Dmitry Kaminskiy, Managing Trustee of the Biogerontology Research Foundation. Established in 1882, Oxford University Scientific Society is one of the oldest science societies in the world. It organizes debates, events and talks, and offers its members the opportunity to listen to interesting and talented speakers who are at the forefront of their field. The society offers its members the opportunity to listen to interesting and talented speakers who are at the forefront of their field. The talks are held weekly and are intended to be of general scientific interest. Past talks have included Sir Martyn Poliakoff, Professor Alexander Halliday, and Sir Roger Penrose. The society also organises free or subsidized visits to places of scientific interest. Past events have included tours of the Joint European Torus project, the Bodleian Library, the Oxford Museum of the History of Science, the National Space centre in Leicester, the Body Worlds exhibition in London and the MINI factory in Oxford.